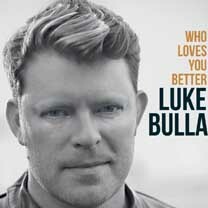 George Graham reviews Luke Bulla's "Who Loves You Better"
Progressive bluegrass, as it is sometimes called, has been evolving into the realm of singer-songwriters. Groups like Alison Krauss & Union Station and Nickel Creek inspired a cohort of bluegrass pickers to create music beyond traditional bluegrass tunes, and use the instrumental setting of bluegrass to replace the usual strumming guitars of the folkies. Recently we have featured albums by Sarah Jarosz and Sierra Hull that are in that mode, This week we have another worthy example. It’s the new release by fiddle player and multi-instrumentalist Luke Bulla, called Who Loves You Better. Luke Bulla has been playing bluegrass for pretty much his whole life. He grew up in a musical family and was on stage singing with his family’s band from age four. He took up the fiddle at seven and by this teens he winning competitions, winning seven times in his age categories. And then at age 16, he was the youngest person to win in Nashville’s Grand Champion division. In 1999 he moved to that city and began working with well-known artists, including being a member Ricky Skaggs’ Kentucky Thunder, and collaborating with artists including John Cowan and Allison Krauss. For the last several years, he has been a key member of Lyle Lovett’s Large Band. Who Loves You Better is Luke Bulla’s second solo album. On it he is joined by numerous notable guests, including Jerry Douglas, Sam Bush, Noam Pikelny and John Cowan, and there are guest vocals by Ms. Jarosz, Maura O’Connell, and Sharon and Cheryl White. Luke Bulla wrote a few of the songs on the album, but like many a Nashville project, the album’s songs are from a variety of composers, including the late Guy Clark, Buddy Miller, and there’s even an old Tin Pan Alley standard by Cole Porter that Bulla and company dissect and reassemble. And on the original tunes, Bulla collaborated in the composing with others including Guy Clark. The result is a satisfying album of intelligent acoustically-instrumented songs with a Nashville tinge. Bulla is an appealing vocalist who would do well singing country music. Fiddle player and multi-instrumentalist Luke Bulla’s new second album, Who Loves You Better is a high quality bluegrass singer-songwriter style album with excellent musicianship, and some notable Nashville-based guests including Jerry Douglas, Sam Bush John Cowan, and Sarah Jarosz. And though there are three original songs by Bulla, most of the material comes from other Nashville-based songwriters, whose compositions are literate and tunefully appealing. One thing that is missing from the album is flashy fiddle work by Bulla, who was known for being a hotshot fiddler prodigy in his youth. And most of the songs are understated to the point of sounding melancholy at times. Our grade for sound quality is a B+. The recording is generally clean and warm, but suffers from the endemic over-compression, that afflicts so much of the music business, cranking up the volume so that’s loud all the time, and taking away the dynamics of the performance. The bluegrass scene has evolved to the point where there is a kind of merging with the singer-songwriter style. Luke Bulla’s Who Loves You Better is a worthwhile example.